Bayern Munich maintained their 100% record in the Bundesliga by thrashing second-placed Borussia Dortmund. Pep Guardiola brought Jerome Boateng and Mario Gotze back into his side, although surprisingly Arturo Vidal remained on the bench. This seemed set to be a straightforward 4-2-3-1 system, although Guardiola had other ideas up his sleeve. Thomas Tuchel, facing Bayern for the first time since succeeding Jurgen Klopp as coach, was only able to name Marco Reus as a substitute for fitness reasons, and also had defensive issues that he patched up rather unconvincingly. Crucially, both coaches decided upon surprise formations from the outset. Guardiola elected to play a 3-3-1-3ish system, which featured Philipp Lahm moving forward to become a shuttler to the right, and Mario Gotze on the right wing, hugging the touchline on the opposite flank to Douglas Costa. Bayern needed width from these two, with no full-backs or wing-backs behind. Tuchel, meanwhile, used a 4-3-1-2, which meant Henrikh Mkhitaryan playing as a second striker to the left, although floating around on the periphery of the game. Gonzalo Castro was surprisingly fielded in a a left-of-centre midfield role, while natural midfielder Sven Bender was in the centre of defence and centre-back Sokratis Papastathopoulos played at right-back, where he never looks entirely convincing. The result of all this, though, was basically that the side cancelled each other out in midfield – it was effectively a diamond versus a diamond – and both had a spare man in defence. Bayern were 3 v 2 at the back, Dortmund 4 v 3. The unusual formations didn’t create a significant overload in one area of the pitch. This was a typically ‘German’ game of football, with both sides trying desperately to remain compact, preventing the opposition finding space between the lines. The defences pushed up dramatically and the two forward lines, particularly Dortmund’s, dropped back to create a barrier when opposition defenders tried to play the ball into midfield. Therefore, the game was extremely congested in midfield, and none of the eight players in that zone were prominent. The only exception was Thomas Muller, although his best moments came when he moved away from the midfield zone and into attacking positions. Who, then, was getting time on the ball? Well, basically it was either a centre-back or deep-lying midfielder on either side. With the midfielders focusing on stopping each other, one of the Dortmund centre-backs was often free, although when Muller moved forward to press 2 v 2 with Robert Lewandowski, it meant space opened up for Julian Weigl, and he could have positioned himself better to find space, receive passes, and maybe even dribbled forward to attract another Bayern midfielder and allow one of his teammates freedom. None of this happened, and therefore the likes of Mkhitaryan and Shinji Kagawa were starved of service and marked tightly. For Bayern it was roughly the same situation. Usually, Pierre-Emerick Aubameyang dropped onto David Alaba, and Dortmund were essentially 4-3-3-0 without the ball, leaving Javi Martinez free. He was incredibly ponderous in possession and scared to bring the ball forward, which was a sad but understandable sight given his lengthy injury problems – beforehand, he was one of the most dynamic defensive players around. He tried to attract Kagawa forward before playing the ball into Alonso, but this only happened a couple of times, and after the ball had spent far too long in defence. Therefore, with (a) everyone in midfield struggling to find room, (b) the defenders getting time on the ball, and (c) loads of space in behind the opposition, the solution was simple: don’t play through midfield, but instead play long balls over the top. The game’s first key moment came on four minutes, from exactly this situation. Mats Hummels received a pass towards the left, and launched a huge straight ball downfield for Aubameyang, who started on the right but made lateral runs in behind the defence. Bayern were a little unprepared for this, and Alaba had to keep following him, almost sweeping in behind Jerome Boateng on the opposite side. In this incident, Alaba pulled back Aubameyang on the edge of the box, a ‘last man’ foul, although it wasn’t a clear goalscoring opportunity – Aubameyang hadn’t collected the ball and wasn’t certain to reach it. Still, it was a desperate challenge and showed Bayern were vulnerable to this type of attack. Bayern could have launched similar attacks, but Martinez, as mentioned, was simply being too slow with the ball. Therefore Guardiola made a very subtle but absolutely crucial change. He switched the positions of Martinez and Boateng. This was the most Guardiola change you’ll ever see. 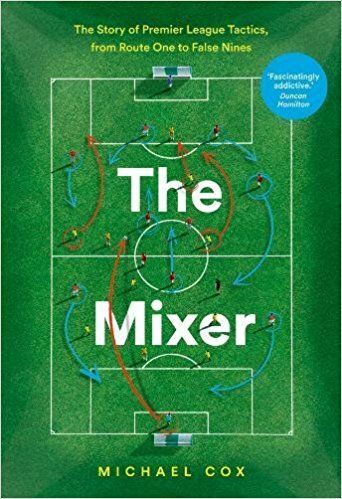 It was unconventional (you don’t ever see centre-backs swapping positions midway through a game), it was subtle (many in the stadium wouldn’t have even noticed) and it underlined the concept of universality (it was a change in defence – to improve the attack). It was also the game’s key moment. Now Martinez was faced by Mkhitaryan, and Boateng was free in the centre. And, within 5 minutes, Bayern were ahead after Boateng exploited his new-found freedom and launched a pass downfield for Muller breaking in behind the defence (drifting into the space between Hummels and Lukasz Piszczek, who were looking at Lewandowski and Gotze respectively). Muller took the ball past Roman Burki and scored. It was Route One, but it was also attributable to Guardiola’s change. Boateng continued to hit these long balls from defence, sometimes in behind the opposition but also out to the wingers. In the first minute of the second half, Bayern essentially wrapped up the game, going 3-1 up, from an almost identical goal – Boateng’s long pass found Lewandowski running in behind, and he scored. It was reminiscent of Juventus’ play under Antonio Conte – when Pirlo was being tightly marked, Leonardo Bonucci would play the Pirlo passes. Here, Boateng was playing the Alonso passes, and created more chances than anyone else in the game. 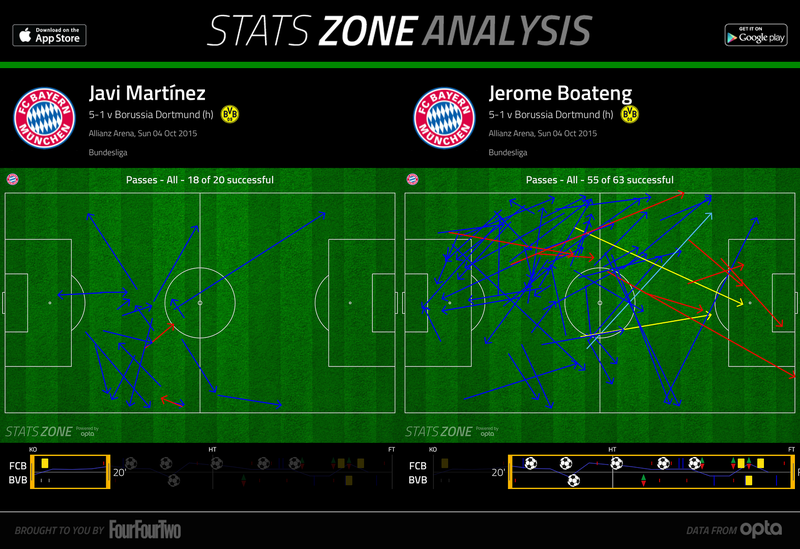 The contrast between Martinez’s passes before the switch, and Boateng’s afterwards, was huge. Before Bayern took command, though, there were formation changes which were crucial to the game’s pattern. Tuchel decided to switch from 4-3-1-2 to the 4-2-3-1 most expected he’d start with – Castro moved to the right, with Aubameyang and Mkhitaryan both shifting a little left. For a moment Dortmund seemed entirely disorganised, and went 2-0 down when Mkhitaryan fouled Thiago in the right-back zone (which made little sense considering he’d just gone to the left). It was difficult to tell whether Tuchel’s change had any relevance to that concession, but it definitely had relevance to the goal Dortmund scored immediately afterwards. Castro was now on the right, and played a lovely cross from that flank in behind the Bayern defence for Aubemeyang, now a centre-forward, to turn in at the far post. That suggested Tuchel wanted Dortmund to exploit the gaps on either side of Bayern’s three-man (which, incidentally, is exactly how Dortmund opened the scoring against Bayern last year) and therefore Guardiola switched formation himself, moving to a 4-2-3-1 shape which basically involved Lahm moving to right-back and the defence shifting across, and Thiago sitting a little deeper. The game now had a slightly different pattern, although because Guardiola responded to Tuchel’s switch, we still had a spare man at both ends. That said, the midfields were now 3 v 3 rather than 4 v 4, and everyone had a little more space in the centre, especially as Dortmund’s pressing dropped as the game continued. Bayern ran away with the game in the second half. They used width very nicely, with Costa always going down the line dangerously, although the crossing was poor from both flanks – none of Costa’s passes found a teammates. 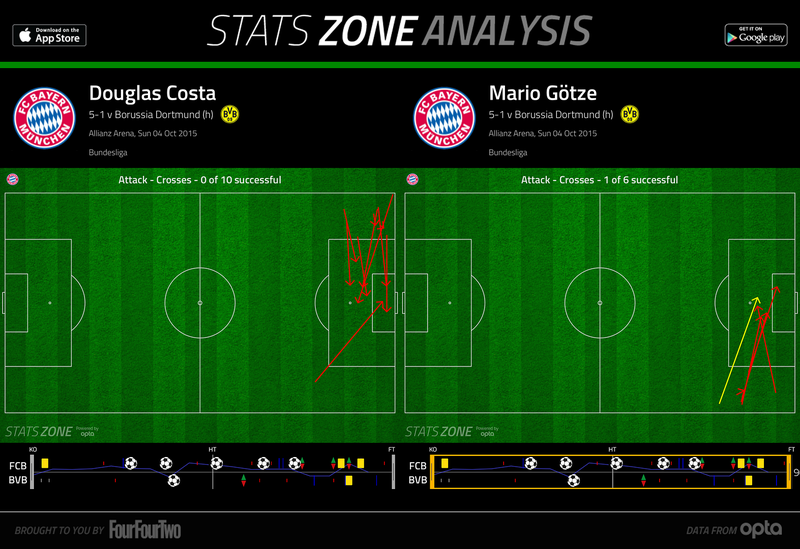 Gotze set up Lewandowski’s second with his final cross of the game. Reus was introduced and showed flashes of inspiration but clearly wasn’t 100% fit, while Guardiola introduced Vidal for Thiago to increase Bayern’s mobility in the centre of midfield, an option Tuchel simply didn’t have. The second half was a little one-sided, and also suggested that a genuine Bundesliga title fight this season is unlikely. The scoreline suggests Bayern battered Dortmund – and in the second half that was true – but this was a genuinely interesting gamein the first half. Surprise formations made the opening to the game interesting, and Dortmund’s direct play in behind Bayern was causing Alaba problems against Aubameyang. And it was a proper tactical battle, too – Guardiola’s defensive switch was crucial in two Bayern goals, while Tuchel’s formation switch got Dortmund back into the game, and meant Guardiola had to respond. Ultimately, though, Bayern were simply too strong. You have got it wrong in one place. Pep Guardiola did not switch the formation just once. He changed it nearly 5 times. Bayern’s strucutre was changing accoring to – the overloads (right and left), midfield play, defensive transition, and after Dortmund’s shift to 4-2-3-1. In my opinion there was not much difference between the philosophies of Thomas Tuchel and Guardiola. The only thing that mattered was – Tuchel’s players did not respond in the proper manner. They were losing their positional structure while attacking in the final third, whereas Bayern were keeping the required shape for ball retention and circulation. Also, Dortmund did not properly try to execute the principles of JdP. They were not overloading or targeting the half-spaces (in the previous games, theyr were doing this). The 4-3-1-2 by Tuchel was rather surprising. Kagawa’s movements in pressing was leaving space for Xabi Alonso or one of the central defenders of Bayern to move into. Julian Weigl, still inexperienced, was not responding properly to the actions of Kagawa. There were, Michael. Pep was constantly switching his defenders from back 4 to 3 depending on the type pf press of Dortmund. Had Tuchel started with 4-2-3-1, Bayern would have also started with a back four. Pep was constantly changing structure to the situational threats posed by Dortmund. Pep doesn’t believe in one formation. He actually said that numbers like 4-3-3, 4-4-2 don’t mean anything to him. It is not the shape but the interpretation of the ideas using the shape that matters. Tell me, why did Pep not start with a proper center back against Bayer Leverkusen? Boateng had been suspended and Benatia was injured. One solution might’ve been playing Dante, but due to 1) his bad ball-handling under pressure and 2) bad reactions to long-balls, Pep chose not to play him. So he opted for Alonso and Alaba as sweeper and stopper, plus Lahm and Bernat as width-providing “false CBs” (against Bellarabi and Mehmedi), and Vidal in the 6-role, effectively a 1-3-1-2-3 formation, to counter Leverkusen’s intense pressure. With having so many playmakers in his own defensive third, he sacrificed aerial superiority, but he ensured Bayern had the calm build-up play that Leverkusen didn’t want them to have. I’m sure Pep craved to have Boateng in that game, but he has created a team that can win big games even with its key players missing. You sir, should start posting again here. I miss your stuff. Too long being it let the opposition get back into a defensive shape and attacks were harder to build. Love that you call the center backs switching the most Guardiola change. Reminiscent of how he had Puyol and Pique keep rotate between left and right when up against Madrid in the good ol’ days. Always keeps the battler against the opposition and the smarter more technical gifted free to play out from the back. Shame about Martinez’ fear on the ball, was great during the treble season and was always a player Guardiola coveted. Wow, fantastic analysys, as always. We’ve missed you! I simply want to tell you that I am just new to blogging and honestly enjoyed your postof soccer news. Nice to see you again!I would love to see a best 11 of the past season, even though is going to be a little late! Welcome back. It’s great to see you starting to post analysis of games this season. It would be great if you could analyze the drubbing Man Utd received at the hands of Arsenal at the Emirates this past weekend. I would to know whether it was a failure of Van Gaal’s tactics or failure of the players to follow his orders. Thanks. All hail the return of the best football’s tactical analysis website on the internet. Enjoyed your brilliant writings on The Guardian and ESPNFC, too. just wanted to say that i checked this every 2-3 days since last post, please don’t leave us again. Finally, Zonal Marking is back! Can’t be happier. Bayern seem to have a solid, steely side complete with versatility and depth this season, while Dortmund is simply a rejuvenated one that is yet to develop the complexity that Guardiola has instilled into his Bayern. Perhaps a fully fit Dortmund would have been able to make this a tighter contest? Hey, just curious, how often is sporadic? Every elite clash (Chelsea-United, El Clasico and big champions league games)? 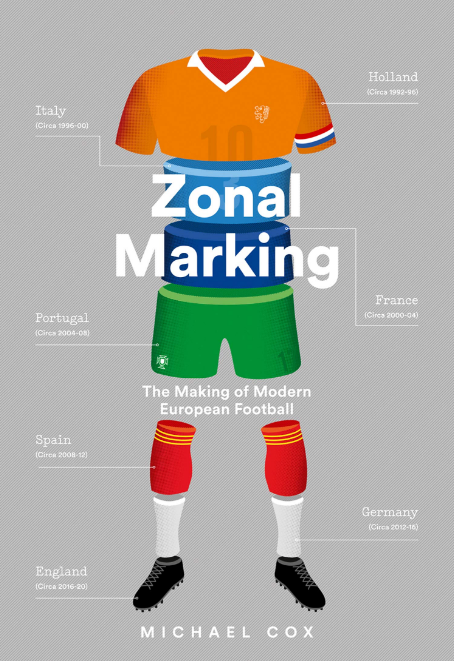 Once more, hail zonal marking! I miss stuff like TEAMS OF THE DECADE. I personally prefer in depth team analysis rather than match analysis. Also I really enjoy when you pick a fantasy team (espnfc champions league team or the blizzard football manager league). Would be great to see more on that such the best counter attack team, or the best possession based fantasy team, etc. And let your readers participate. As long as Pep changes his CBs’ positions to get them all used to playing the libero role (which is resurfacing to great importance the last years) I’m convinced he’s the best coach football has at the time. The man has put every one of his players in every possible position, there’s no such thing as a “one-way player” in Pep’s mind. Javi Martinez? He has played from sweeper to second striker/deep lying target man during Pep’s Bayern tenure! What luck for these guys to have him as coach, he makes each one of them not only a better player, but also a wiser one. Αs there’s no parthenogenesis though, we gotta give credit to Guus Hiddink for playing a not very different brand of football than Pep’s, with far inferior players, in PSV and Australia. In fact, even Lokomotiv Moscow under Yuri Semin had practiced a 3-3-3-1 with Ignashevich as the midfield-joining centre-back, evolving into 2-1-4-3 in attack. And of course Marcelo Bielsa.